Tactical asset allocation sounds intimidating, but it's nothing more than the old saying "don't put all your eggs in one basket". It's a way for you to balance the assets you plan to buy (or sell). Stocks are one type of asset and bonds are another. As Barry Ritholtz says on his blog, The Big Picture, "Stock picking is for fun. [Tactical] asset allocation is for making money over the long haul." If you want proof, just take a look at stock market returns in 2008 in the chart below. Everyone that tried to find the world's best stock probably ended up losing money. You would have had better returns putting your money in a savings account! Bonds performed well...nothing too exciting. Fast forward to 2009...cash was the lowest return (without losing money of course). Bonds performed about the same, and stocks exploded higher. You could have picked stocks by throwning darts at the business section and everyone would have complimented you on your stock picking prowess. Simply put, tactical asset allocation is putting your money into investments that don't behave the same way at the same time. The goal is diversification; to spread your money across several different types of assets, so that no one asset class will make or break your personal finances. This means that "diversification" is actually the result or outcome tactical asset allocation. If you want diversified investments, you need to use tactical asset allocation. Traditionally, investments are grouped into four categories called asset classes. Stocks (equities) and bonds (fixed income) are the two most commonly known, with real estate and insurance coming in third and fourth respectively. More recently, asset classes such as currencies and commodities have gained popularity due to the increased exposure created by financially engineered products (such as ETFs). Why is Tactical Asset Allocation Important? Prices are very dynamic. For example, what will happen to the price of Ford stock when Alan Mulally leaves the company? Will it rise or fall? For how long? You just don't know. You can watch this happen on a much smaller scale using real-time ticker updates on your favorite stock. Tactical asset allocation attempts to capture the price increases made during long-term trends in different asset classes. The same issue applies to long term investing; you cannot predict the future price. So how can you plan to achieve the average 6%-8% that "common knowledge" says you will need to earn on your money until you retire? As shown in the chart, no one asset class is always the best. Look at "International Equities" from 2008 to 2009; down ~43%, then up ~32%. Asset class prices normally move in different directions. This means that when the stock market falls in price, other asset classes (such as gold or bonds) usually rise in price. Asset allocation and diversification reduce the impact of one asset class on your overall investment portfolio, but no investment is risk free. This is why position sizing is so important. You've heard it before; historical performance is not a guarantee of future returns. Tactical asset allocation is really a type of buy and hold investing. But instead of buying and selling stocks, you add other asset classes to the mix such as bonds, gold, silver, real estate, currencies, etc. This way, when one asset goes down in price, others rise. Ideally, the gains are higher than the losses, and the result is a slow, steady growth in your overall portfolio. The "tactical" part of asset allocation comes from your investing process. Since you're always protecting against loss (preservation of capital), you have already selected the maximum loss that activates your sell rules. A "bull market" in equities normally lasts 4-5 years before running into a correction (historically speaking). 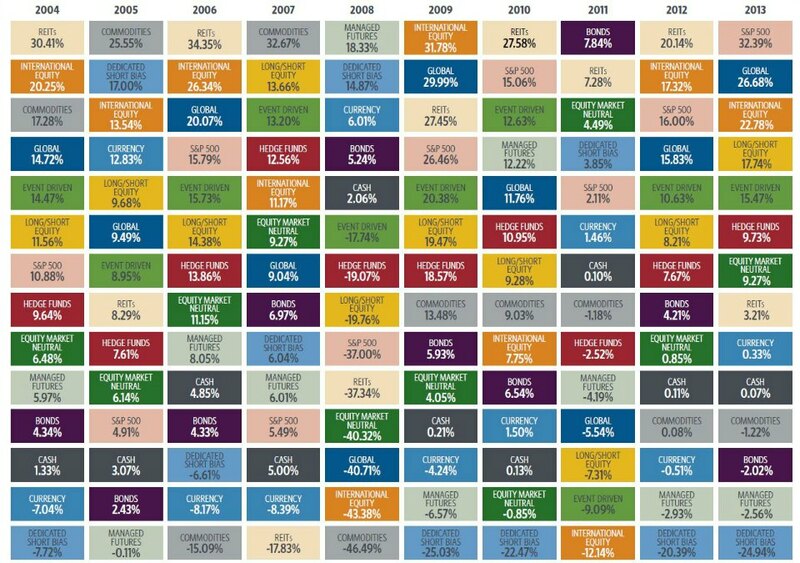 Looking at the asset class table above, you can see that the S&P500 fell from 2000-2002, then rose from 2003 to 2007, fell in 2008, and then started to rise again from 2009 to 2013. As the market rolled over during the second half of 2007 and into 2008, your sell rules would have triggered and a larger portion of your portfolio would be in cash. You may decide to stay in cash and wait for equities to rebound. You may decide to move a majority of your money into bond investments for a year or two. Either way, the goal is to get the bulk of your money into something that is going up in price (or at least not going down). At that point, you're "tactic" would be to evaluate the situation, and look at asset classes that historically rises when equities fall (i.e. you're looking for assets with a beta of -1). Notice I did not mentioning selling all your stocks and dumping all your money into x,y, or z. You won't know ahead of time how long an asset class will rise in price. And moving your money isn't free (commissions and redemption fees apply), so only move enough to protect your overall portfolio from loss and leave the rest alone.